The sixth book in the Alex Verus series. Alex Verus and the Light Council have never gotten along. But with his former teacher back in Britain, Alex is in desperate need of allies, and he’ll do whatever it takes to get them—even if it means accepting a job with the Keepers, enforcing magical law. Once again caught in the middle of a deadly conflict, Alex will need all his abilities to figure out who his friends are—especially when enemies are hiding on all sides . . .
You can read the first chapter of Veiled here. The following links will take you to online retailers where you can order Veiled. 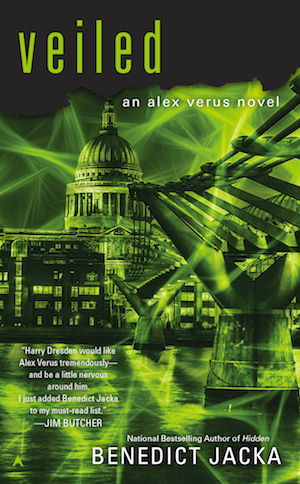 Like the previous books in the Alex Verus series, Veiled is available in audio format. You can find it at the publisher’s website. I love your books in audio! Gotta agree with you Jason. Helps listening while doing errands and chores. Keep up good work Benedict! Why is this book and other volumes in this series not available in a kindle edition in the US? Great series one of the best of this genre I have read. Hate to shut it down after #6.